Zion Market Research has published a new report titled “Optical Network Equipment Market by Application Type (FTTH [Fiber-to-the-home] and FTTB [Fiber-to-the-building]) and by Technology Type (Asynchronous Transfer Mode PON, Broadband PON, Gigabit PON, and Ethernet PON): Global Industry Perspective, Comprehensive Analysis and Forecast, 2017 - 2024’’. 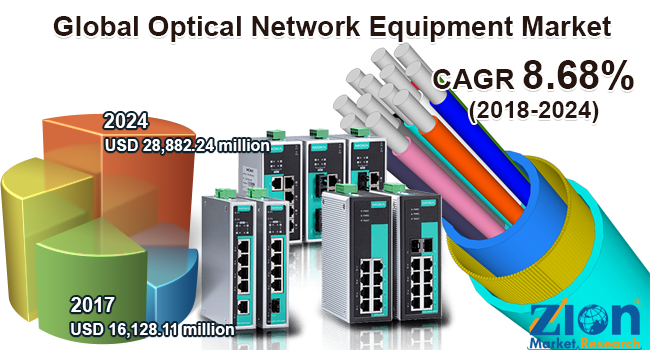 According to the report, global optical network equipment market was valued at around USD 16,128.11 million in 2017 and is expected to reach approximately USD 28,882.24 million in 2024, growing at a CAGR of 8.68% between 2018 and 2024. Optical networking can be described as a means of communication through an optical fiber in which signal is encoded into light pulse and is transmitted among various nodes of telecommunication network, which is operated from limited range of LAN (Local Area Network) to WAN (Wide Area Network) which can cross metropolitan areas as well as national and international transoceanic distances. Optical networking is a form of optical communication through optical amplifiers, lasers, LED’s and wave division multiplexing (WDM) used to transmit larger data with maximum possible bandwidth and minimum losses. Optical amplifiers, fiber – single or multimode, light source – laser/LED, multiplexer and demultiplexer, optical switch, an optical splitter, and circulator are some of the major components used in optical communication. Presently, major companies in the optical network equipment market are focusing on developments of the emerging technologies, as there is a continuous increase in the use of mobile smartphones, laptops, and PCs. This gives rise to a tremendous increase in the usage of online gaming, chatting, video surfing, and online shopping. Similarly, companies providing these services are asking for more high-speed data; as there is a continuous increase in both residential as well as business customers in this market. The existing networks will not be able to meet this demand. Thus optical network came into a role and all these factors will drive the demand for optical network equipment at a high pace in the forecast period. With the need of providing broader bandwidth with increased transmission speeds, the network provider, and networking equipment manufacturer will be forced to provide such infrastructure and networking equipment which can withstand higher digital data traffic with more ease over the existing network. This is expected to create more growth opportunities in this market. Apart from this, factors such as emerging terabit networking and increase in cloud storage space by most of the companies will drive the growth of the optical network equipment market. However, the high installing cost of optical networking equipment for operators is one of the major factors expected to hinder the early adoption of optical networking equipment. Thus small industries find it difficult to adopt this solution for smooth high-speed data traffic. The optical network equipment market is segmented on the basis of application, technology, and regions. On the basis of application, the market is segmented as FTTH (fiber-to-the-home) and FTTB (fiber-to-the-building). Whereas on the basis of technology it is further divided into Asynchronous Transfer Mode PON (APON), Broadband PON (BPON), Gigabit PON (GPON), and Ethernet PON (EPON). Furthermore, on a regional basis, the market is segmented into North America, Europe, Asia Pacific, Latin America, and the Middle East and Africa. The major companies in this market are Huawei, ZTE Corp., Cisco Systems Inc., Fujitsu Network Communications Inc., DASAN Networks, Motorola Solutions, Mitsubishi Electric Corp., Verizon Communications Inc., Alcatel- Lucent, Calix, and others. The report segmentation of optical network equipment market is as follows.